Skyforger, who are almost certainly Latvia’s best known and most popular heavy metal band, have released their latest album entitled Senprūsija. As the title would indicate, the theme of this album is Ancient Prussia, and the songs are about Prussian history, legends, and culture of the extinct Prussians. Skyforger are often called ‘pagan metal’ or ‘folk metal’, as many of their songs include aspects of Latvian folklore and folk songs, pagan traditions, as well as legends (their previous album, 2010’s Kurbads, was about the legend of the Latvian warrior Kurbads). The band play an extremely aggressive brand of metal, with relentless guitars and drums, and vocals are are more shouted than sung. The group, made up of vocalist Peter (the members have declined to provide their last names in the CD booklet or on their website) on lead vocals and guitars, Edgars ‘Zirgs’ on bass and vocals, and Edgars ‘Mazais’ on drums, with Alvis Bernāns providing additional guitars and vocals regularly perform all over Europe in solo concerts and many metal festivals, and will be one of the featured guests at the German pagan metal festival Heidenfest 2015 in October. 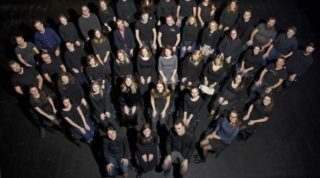 Helpfully, instead of providing the lyrics in the booklet (the lyrics are still available via the group’s website), Skyforger provide extensive notes in English (Latvian versions available on their website) on each song – what the song is about and some historical and ethnographic notes. Besides providing detail on what is perhaps a lesser known topic (the history and legends of Ancient Prussia), they give the listener a deeper appreciation of the music and themes. The group even note a historical consultant – Agris Dzenis – in the credits. Though almost all of the album is in Latvian, the first song ‘Ei skīja, skīja’ is in the Ancient Prussian language. In what is the calm before the storm, this somber song, which shows that singer Peter has an excellent deep bass voice, provides a moment’s respite before the scream that launches the title track ‘Senprūsija’. The chugging guitars provide the backdrop for this song about the ancient Prussian lands and the warriors that were made there – ‘Senprūsija – Baltu slava un gods tā reiz bija, varoņus izauklēja, par viņu tie asinis lēja’ (Ancient Prussia – once the praise and honor of the Baltic people, they raised warriors, and they spilled blood for it). The song also features traditional instruments, such as the ‘stabule’ (pipes). Not surprisingly, many of the songs on the album are about fighting and war, appropriately for this style of music! The song ‘Rāmava’, at nearly seven minutes, is one of the longest and most memorable tracks. Beginning with some excellent guitar work by Peter, the melodic introduction then is supplemented by ritual chanting in Prussian, which is appropriate for this song about the Romuve grove, one of the most sacred places for the Ancient Prussians. The lyrics include references to the three gods who lived in the hollow trunk of the ancient oak in this grove. Perhaps the most tragic song on the album is ‘Melnās buras’, a song about the devastating effects of the plague on the Prussian nation during the Great Northern War (1700 – 1721). The shrill guitars, sounding almost like an alarm, weave through this song about the misery and death that the plague brought. As per the notes, this was the event that brought an end to the Prussian culture, as it killed more than a third of the Prussian nation. Compounding the tragedy was that many of the keepers of the oral traditions also died, meaning that many rituals and much knowledge was lost forever with their death. The trouble with this aggresive style of music is that, over a period of time, the songs start to sound very similar and can be difficult to distinguish – though this is not something unique to Skyforger – there are literally hundreds of bands that play a similar way. Skyforger are at their best and most interesting when integrating traditional Latvian music and instruments into their music – that is when their sound becomes more original, and they stand apart from the many groups in this genre. 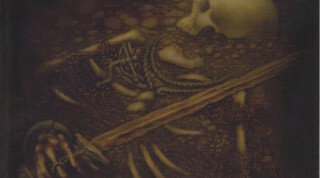 Though Senprūsija does offer elements like these periodically, the album could have used more of them, as well as a bit more actual singing (rather than shouting or growling). 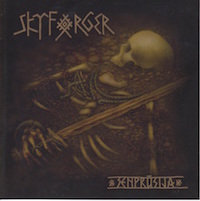 Skyforger remain the undisputed champions of Latvian heavy metal, and Senprūsija is yet another ferocious entry in their catalogue. With nary a breather over the course of its twelve songs, the group display their unique presentation of the story and legends of Ancient Prussia, simultaneously providing an aural assault and history lesson. Though their brand of music may not to be the taste of many listeners, the faithful will continue to have their faith reaffirmed by the group’s distinctive melding of legends, folklore, and intense music. For more information, please visit the Skyforger website.